• Option to have access to ROOM 4 via adjoining door Room 5 comprises 46sqm of bedroom and living space with an adjoining bathroom suite. Room 5 contains a separate study area complete with custom made sitting area, desk and LED TV. This is the only room with twin beds where it is adjoined to ROOM 4 which provides guests with an option if they are looking for twin rooms. 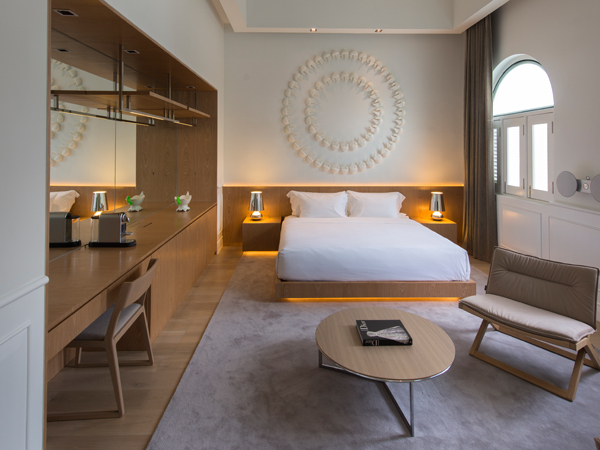 Your room is furnished with art and design pieces sourced from all around the globe, in particular a privately commissioned artpiece above the beds by Ashley Yeo. This piece combines a selection of heritage buildings with specific floras indigenous to Penang. There are ships surrounding the main composition, a reference to the sea voyages of Sir Norman Macalister. 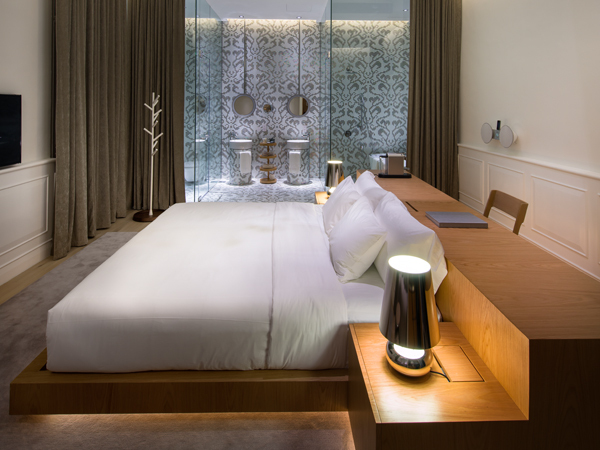 • Pillow Menu Room 8 comprises 41sqm of bedroom and living space with an adjoining bathroom suite. This room is one of the few rooms which features exposed truss beams originating from when the building was constructed circa 1900s. Room 8 is furnished with a privately commissioned artpiece above sofa alcove by Malaysian based artist Thomas Powell. This piece is combines key events throughout the life and times of Sir Norman Macalister. 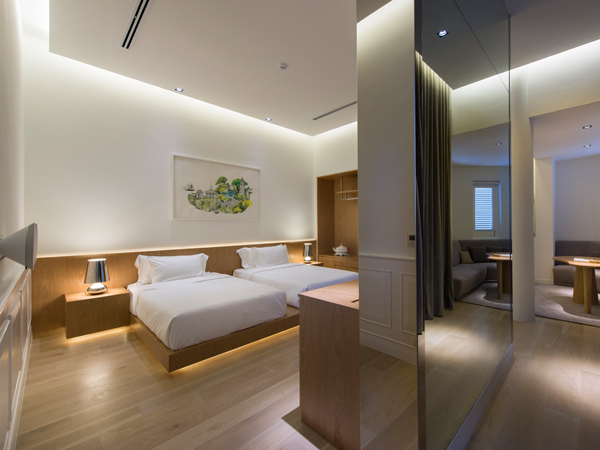 • Pillow Menu Room 1 comprises 53sqm of bedroom and living space with adjoining bathroom suite. Also affectionately known as our Bridal Suite, it has a separate dressing area. This dressing area has a floor to ceiling mirror and generous wardrobe space for that ?special? dress. Room 1 has a privately commissioned Love Sonnet above the bed by Arron Lee. This sonnet done in old English, influenced by the writings for Shakespeare to depict a rendition of true love found between 2 people. 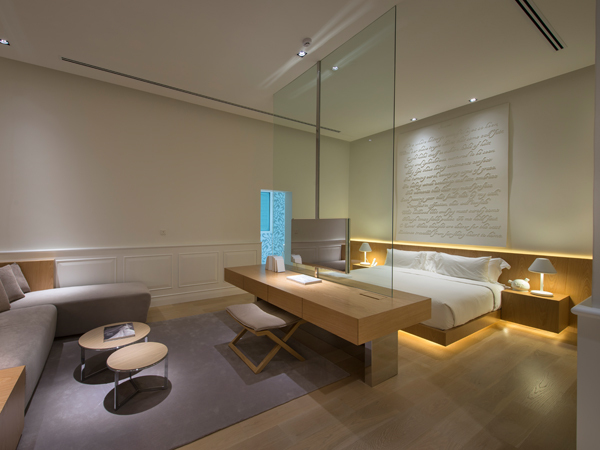 • Pillow Menu Room 2 comprises 52sqm of bedroom and living space with adjoining bathroom suite. The only room to contain a four poster USA King sized bed. This room faces the front of Macalister Mansion with a view of the swimming pool and The Lawn. Room 2 has a privately commissioned photograph by Howard Tan, a local Penang photographer. The photograph captures the majestic sculpture of the eagle situated at the entrance to Macalister Mansion. 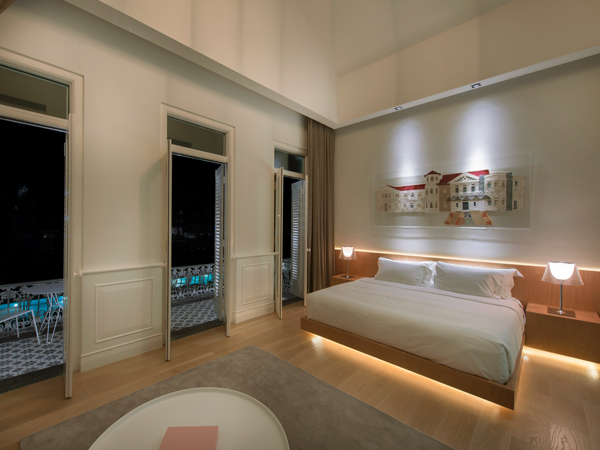 • Pillow Menu Room 3 comprises 60sqm of bedroom and living space with adjoining bathroom suite. The largest room amongst all the Eight Rooms, it also boasts of the original wrought-iron balcony where guests can sit out and enjoy the expansive view of the front of Macalister Mansion. This room is one of the few rooms which features exposed truss beams originating from when the building was constructed circa 1900s. Room 3 has a privately commissioned artpiece by Lee Meiling, a Malaysian artist based in Singapore. The artpiece is a fabric collage of the front façade of Macalister Mansion, each type of fabric and lace specifically tailored to capture the essence of the architecture. • Option to have access to ROOM 5 via adjoining door Room 4 comprises 49sqm of bedroom and living space with adjoining bathroom suite. This turret room has an alcove with the original wrought-iron spiral staircase which leads to the top. Guests can enjoy views at the top of the turret. This room is adjoined to ROOM 5 which provides guests with an option if they are looking for twin rooms. Room 4 has a privately commissioned wire sculpture by Low Chee Peng, a local Penang artist. This artpiece consists of side profiles of Sir Norman Macalister and his wife, facing each other. • Pillow Menu Room 6 comprises 40sqm of bedroom and living space with an adjoining bathroom suite. This room faces the front of Macalister Mansion with a view of the swimming pool and The Lawn. 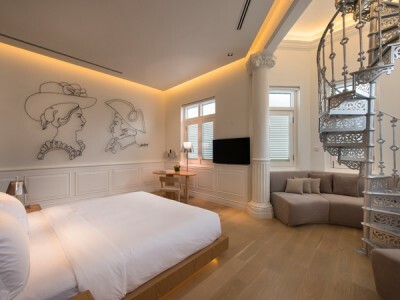 Room 6 is furnished with a privately commissioned artpiece above the bed by Indonesian artist Albert Yonathan. Aptly named ?Sailing the Celestial Sea? this piece comprises hand casted porcelain ships, inspired by the sea voyages of Sir Norman Macalister. 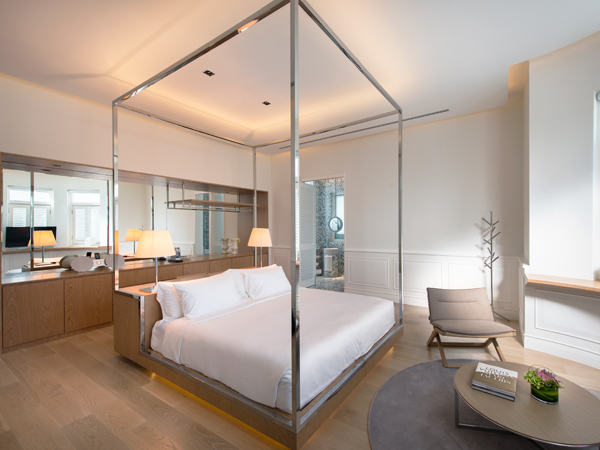 • Pillow Menu Room 7 comprises 51sqm of bedroom and living space with an adjoining bathroom suite. This room has a separate study area with customised writing desk and chair. This room faces the front of Macalister Mansion with a view of the swimming pool and main entrance. Room 7 is furnished with a privately commissioned textile piece in the study are by Grace Tan. Called the Tartan Cube, this piece comprises a contemporary take on the original tartan colours from the Macalister clan in Scotland.